- Publisher This second book in the Panorama series covers the life of Jesus from the Nativity through to St Paul the Apostles and their missionary journeys. This title is also ideal for all Christian families Homeschooling and Sunday School. - Publisher Suddenly Doug felt a sharp pain, like a blow, on the back of his head, and everything went black. In the dangerous back-streets of the South American capital, Doug has uncovered a plot to overthrow the President. But first he has to escape himself - and then he has to convince the authorities of what he has seen. 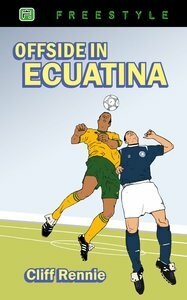 About "Offside in Ecuatina (Freestyle Fiction Series)"
This second book in the Panorama series covers the life of Jesus from the Nativity through to St Paul the Apostles and their missionary journeys. This title is also ideal for all Christian families Homeschooling and Sunday School. Suddenly Doug felt a sharp pain, like a blow, on the back of his head, and everything went black. In the dangerous back-streets of the South American capital, Doug has uncovered a plot to overthrow the President. But first he has to escape himself - and then he has to convince the authorities of what he has seen. Doug Mackay has been spotted by the manager of Dalkirk Albion - and not without reason - as his first class performance in the match against Dalriadia shows. It's not long before talk about the European championships arises and Doug is on the team! Word soon gets out that their first match is scheduled for Czechoslovakia. Doug's father asks him to meet a mutual friend, Mr Frith who has contacts with the Christian church in Eastern Europe. There is a consignment of Bibles that needs delivering to some local Czechoslovakian Christians. Doug who is a committed Christian himself agrees to make the drop even though this could put him in danger. And with Dalkirk Albion's continued success through the European championships Doug continues his dangerous exploits in Bible smuggling. But the biggest threat seems to be coming from his own team. The competitors are at the starting line. Everyone holds their breath, the starter's gun fires - and they're off! Though all of them run as if their lives depend on it, one runner's life actually does hang in the balance. A thrilling tale of adventure set during the Olympic Games in London. Ages 12+.